The Problem: As with Moonlight, this one is pretty perfect, and I hate to criticize it. But also as with Moonlight, I just found its big plot turn to be such a downer that it was hard to love. Storyteller’s Rulebook: Unlike that movie, I thought that this one had far more humanity to it. Even when you’re going through horrible things, you just can’t be heavy all the time. Life moves on, to the extent that our two heroes keep getting caught up in the flow and forgetting to grieve (until they remember at certain moments). 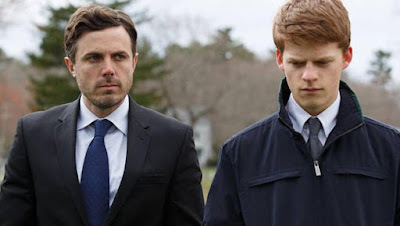 Lucas Hedges’s character isn’t going to just dump his two girlfriends because his dad died: Life must be lived. I liked how this movie exemplified one of our old rules, Screw Ups Don’t Screw Up All Day Long. Casey Affleck’s character, in fact, has a problem in that he’s not screwing up as often as he’d like to. Unable to forgive himself for a horrible mistake, he really just wants to die, but he doesn’t want to kill himself, so he just vows to stay dead inside and throws himself in the way of danger whenever he can. Unfortunately, opportunities to live keep presenting themselves, and he can’t squirm out of the way fast enough. Women take an interest in him, forcing him to push them away, and his ex-wife forgives him, which is the last thing he wants. Worst of all, not enough people want to beat him up to satisfy his masochism, so he has to start bar fights on the flimsiest of pretenses in order to finally get the beating he feels he deserves. Affleck is a screw-up, but you can’t screw up all the time. His life will always be a grand tragedy, but you can’t be tragic all the time. Predictiont Love & Friendship and Silence are in your top 3. Maybe the Lobster. Outside chance of Jackie. But be warned: if Deadpool is top 3, I will be forced to stop reading your blog. Nope all around. I didn't see Love and Friendship or The Lobster, though I heard great things about both. I didn't see Silence or Deadpool because I heard nothing but bad things (albeit bad in very different ways) (and really I just had one friend who saw either movie, so I'm just going off his opinion). Jackie was okay. It's a tragedy that young writers and directors can't get their movies made but in the mean time Hollywood continues to churn out super hero movies like there's no tomorrow. Considering super hero market saturation at least Deadpool tries a sort of new take on the genre and is perfectly serviceable trash. The Lobster on the other hand is one of the most underrated movies of the year. Farreller, as we call him in my home land, still manages to surprise me even after I'd written him off years ago.